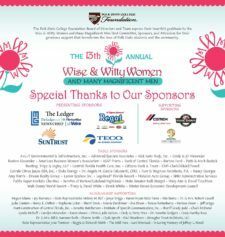 Over 400 guests attended the Wise & Witty Women and Many Magnificent Men events held March 21-22. Our dynamic speaker, Stacy Pederson kept the audience entertained with her stories and the humor she finds in everyday life, which for her includes a house with five teenagers! We are grateful to our sponsors who help make this event possible, and assist the Foundation in the goal of being able to award a scholarship to everyone who needs one in order to achieve their goal of a college degree. Click here to see the photo gallery from the event. Please save the date for next year’s event: March 5-6, 2020.